Amazon (NASDAQ:AMZN) is aggressively removing money-losing products from its platform. This initiative should allow the company to post better margins in its e-commerce business. We might see some slowdown in the retail growth rate, but it will be due to a greater focus on profitability by management. Eventually, this should help in lifting the margins of the entire company and boost the bullish sentiment for Amazon stock. A slower growth rate from the lower-margin retail segment should increase the revenue share from higher-margin segments like AWS and advertising. AWS currently contributes 10.3% to the total revenue base while the “Other” segment (primarily advertising) contributes 4.7%. The growth in the revenue share of these two segments should increase the earnings-per-share estimates and bring down the valuation multiples for Amazon stock. Internally, Amazon lists products which do not make money for the company as cRaP, short for “Can’t Realize a Profit”. These products can vary in size and price. If the shipping and fulfillment cost of a product is greater than the fees which Amazon makes, then these products are added to the cRaP list. Recently, Amazon has started removing the option to advertise these products on its platform. These vendors have been asked to lower the cost of these products on Amazon to again become eligible for advertising. These products can take the form of a $5 bottle of water which takes more money for Amazon to store and ship to customers than it produces. It can also include heavier products, which have much higher shipping costs. This is a smart move by Amazon at the current stage in the company’s business growth. In the trailing twelve months, Amazon had over $200 billion in net sales in North America and international regions. Losing a few billion dollars of sales from money-losing products will not hurt the net sales of the platform. However, removing these products can significantly improve the low-margin retail business for the company and help Amazon stock. Money saved from the retail operations can be diverted to segments which have better growth potential. Amazon will be facing a streaming war in the next few quarters, as new players like Apple (NASDAQ:AAPL), Disney (NYSE:DIS), and AT&T (NYSE:T) join the streaming bandwagon. Amazon needs a healthy war chest to compete against these giants. By saving money in retail operations, Amazon can ramp up its content investments. It is clear that Amazon can easily increase its revenue growth in retail by offering greater discounts or lowering its fees. A greater focus on profitability might lead to slower revenue growth, but it reduces the pricing pressure on the company. We can see that Amazon’s online store sales growth has declined in the last few quarters. It is possible that this segment reports a single-digit growth rate, as Amazon focuses more on profit. The growth rate of AWS and advertising is quite high compared to the lower margin in online store sales. The online store sales is close to $40 billion while AWS and Other sales is only $10.5 billion. The consolidated revenue was $72.38 billion. If the current trajectory in AWS and advertising continues, we should see their revenue share increase from 15% in the last quarter to 30% by the end of 2021. A higher share of more profitable segments should boost the valuation multiple of Amazon stock. An increase of revenue share in profitable segments should help in improving the overall margin of the company. We have already seen rapid growth in net income in the past few quarters. This trend will continue in the near-term due to a greater focus on profitability. A better EPS will also reduce the pricey valuation multiple for Amazon stock. 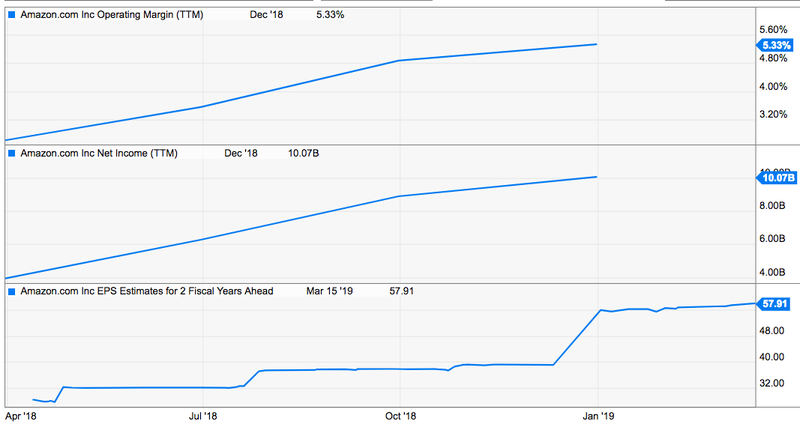 Amazon stock is currently trading at less than 30 times EPS estimates for two fiscal years ahead. The slowdown in revenue can be a short-term headwind for the bullish sentiment in Amazon stock. But Amazon can always kick-start the revenue growth by acquiring another retailer or entering a new business segment. Amazon is removing the option to advertise for products which are losing money for the company. Further restrictions on these products should help in limiting their sales. This will help in improving the margins in the retail segment. It will also allow the company to invest in other segments which have longer growth runway. We can continue to see some slowdown in the retail business of Amazon due to these initiatives. But this slowdown should be offset by growth in other profitable segments, like AWS and advertising. Due to the rapid increase in EPS estimates, Amazon stock is valued at a much lower multiple compared to where it has been historically. 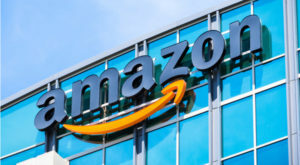 Article printed from InvestorPlace Media, https://investorplace.com/2019/03/amazon-removes-crap-boost-profits/.